We have become the preferred choice of the customers by offering reliable Membrane & Coating Products. These products are executed by our experienced professionals in accordance with the clients' requirements. We make use of optimum quality raw material such as cement and others in the execution process of the undertaken projects. Our offered Membrane & Coating Products are Polyurethane Elastomeric Membrane, Waterproofing Compound (Flexocrete), Epoxy Resin, Phosphating Agent and others. 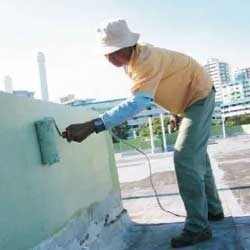 MR. Home Guard – Flexi coat is a single component moisture cured, modified polyurethane elastomeric membrane for the waterproofing of various kinds of surfaces. The product cures to a rough rubber like finish with excellent flexibility. We are looking queries from Pune, Mumbai. MR. Home Guard - Flexocrete is a high solids, high film build and highly flexible cementitious membrane for waterproofing of concrete and masonry substrates. It is also used as sandwich coat between old and new concrete. Outstanding elongation properties. Good crack bridging capability. Bond coat : MR. Home Guard - Flexocrete to be poured in an open container. Cement should be added to this to produce lump-free uniform bonding slurry. Wet the substrate and apply the bond coat. with brush. Allow 15-20 min. before applying second coat if required. Repair plasterwork would start within 15- 20 min of the application of bond coat. MR. Home Guard - EPX is a select epoxy resin specially formulated to provide a durable coating suitable for application to both vertical and horizontal surfaces. It cures to form a smooth hygienic film with good resistance to a wide range of mineral and organic acids, alkalis, fats and oils. Surface preparation is very important in order to achieve maximum adhesion between the coating and substrate. Free the surface from loose material, grease and oil by grit blasting or water jet. Remove deeper penetrated material by mechanical means. Remove all laitance from the concrete surface and then wash it off. Dry the surface completely. If surface is new concrete, then cure it for at least 28 days period of coating. Clean and make rust free all steel surfaces by shot-blasting. We are looking queries from Pune, Mumbai. MR. Home Guard - PLUG is modified cement, which consists of carefully selected additives, which set very fast within few minutes. It is useful in stopping the flow of running water and is effective even under hydrostatic pressure. It is a ready to use product and requires the addition of water only leaking. Dripping of water can be stopped by mixing MR. Home Guard – Plug with water to form a stuff putty consistency which can be used as a plug. To prevent rapid loss of water and consequently loss of strength, standard curing practices should be followed, immediately after MR. Home Guard - Plug reaches its final set. MR. Home Guard - Crack FILL is a specially formulated crack sealing material which has appreciable elastomeric properties. The acrylic crack sealer also has water proofing properties. On drying the film gets penetrated in the crack thereby sealing the same. We are looking queries from Pune, Mumbai. MR. Home Guard - Crack Fill is used to fill all the cracks on the plaster surface. This can be done prior painting. MR. Home Guard - is a single component chloride free liquid that removes the rust and prevents the steel from further rusting up to certain extent. MR. Home Guard - RR is acidic in nature; hence ensure that all the traces of acid are removed completely by washing with clean water, before applying further primer or coal engineering.